The best restaurants in the world used to be limited to a handful of popular cities. London. Paris. Hong Kong. Rome. New York. Boy, times have changed. Now restaurants are creating destinations. The Faroe Islands. The remote coast of South Africa. An island off the coast of Iceland. The Andean highlands of Peru. The far north of Sweden. Svalbard. Now you can add central Lithuania to your wish list. The destination is Kaunas. If you know anything about the Baltic country, this city won’t surprise you. Lithuania’s second-largest city lies 65 miles from Vilnius and 130 miles from the coast. Despite being occupied by Sweden, Napoléon, the Nazis, and Russia/the Soviet Union (numerous times), Kaunas thrived. It’s the academic and cultural center of the country. It’s Gothic, Renaissance, Baroque, and Art Deco buildings somehow survived attacks, wars, and fires. It was called Little Paris thanks to its café culture. It’s even become a UNESCO City of Design and a future European Capital of Culture. Kaunas is truly the heart of Lithuania. Kaunas is a lovely city to visit. It sits at the confluence of the country’s two longest rivers, the Nemunas and the Neris. Old Town is where Kaunas Castle, the Town Hall of Kaunas, the Kaunas Cathedral Basilica, and pedestrian-only streets are located. Parks, shops, and hotels are in the slightly younger New Town. Together, Centras is quite small and walkable. Centras is also where Uoksas is located. Uoksas is the Lithuanian word for burrow, the hollow that a bird digs out of a tree. That’s exactly what the 50-seat dining room looks like. Once you pass through the red-brick facade, it feels like you fell into a modern hole. Gray walls and floors, exposed pipes, and simple wooden tables fill the space. Chairs are draped with cozy throws. Tree branches and moss dangle from the walls. Bird’s-nest lamps hang from the ceiling. They all overlook the open kitchen. Surprisingly, Uoksas is a family-owned restaurant. The Naidenkos are obviously a creative family. Odeta and Artūras opened the current restaurant in 2014. 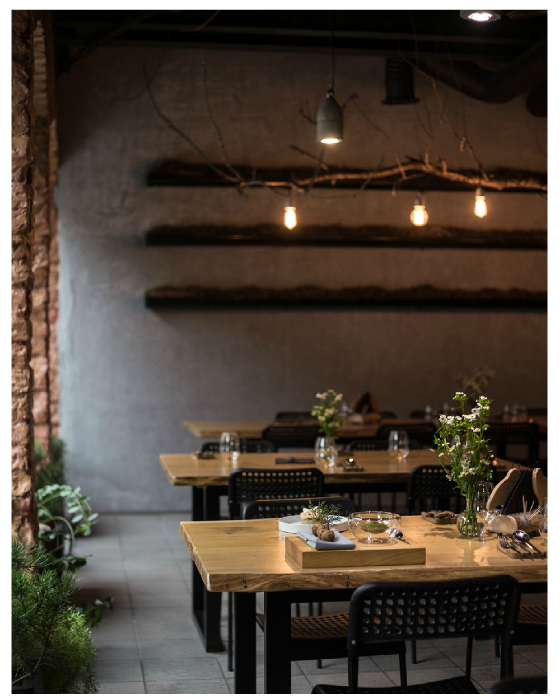 Their natural surroundings, seasonal ingredients, creative menus, and ultra-modern dishes earned them a nod as one of Lithuania’s best restaurants and a spot in the recent White Guide Nordic. Brunch, lunch, and dinner are served at Uoksas. It’s the well-priced tasting menu, paired with rare wines, that’s truly worth the trip, though. The six-course tasting menu features two starters, two mains, and two desserts. Trout salted with spruce needles. 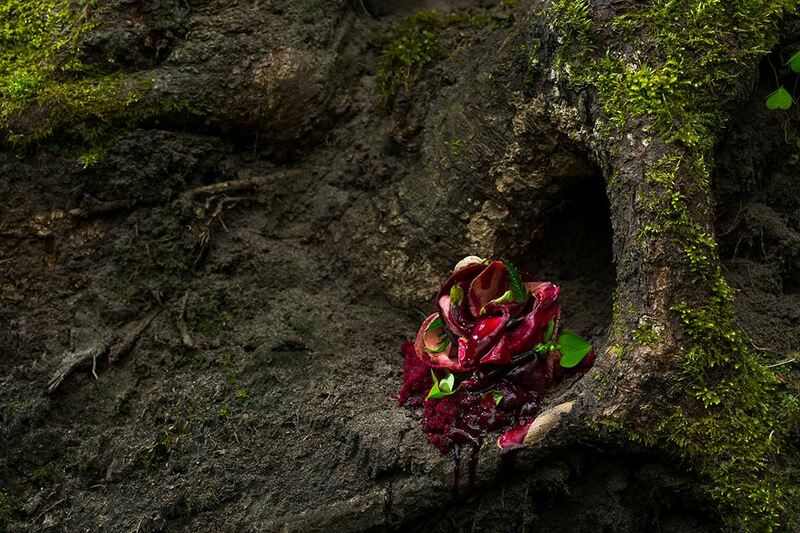 Beef heart soaked in beetroot juice. Cod steamed in chicken broth. Quail baked with a blueberry and juniper glaze. Honey cake topped with beeswax. Caramel koji cut with apple cider foam. The dishes may sound simple, but they’re actually very far from it. Keep an eye on Uoksas.